You can do everything right, from making sure that all requirements your lender has listed has been met to dealing with unexpected glitches during negotiations, such as getting on the same page with the potential buyer or seller. Now that you can see the end of the finish line, you may feel the urge to celebrate. However, it may be wise to hold your horses, at least for the meantime. Unless the documents saying that the Melrose Park IL property is sold has been signed, you can’t afford to rest easy, especially if this is one deal you want to close cleanly and without any hiccups. Want to buy or sell real estate fast? Read on to be ready for any potential issues that could arise before you close that deal. Go over your mortgage paperwork multiple times prior to submission. Any incorrect information or information that has been fraudulently entered is more than enough cause for the bank to refuse your loan. This poses a major obstacle to buying any house. Inspect your mortgage application forms to ensure that all fields are filled-up with correct information. If you are unsure, call your mortgage provider to make sure everything looks good. This way you are assured that the lender’s side of things will go smoothly. If your mortgage providers sees issues with the application or forms, you’ll have ample time to resolve the same prior to closing. Review the HUD and other forms as early as possible. It is not impossible for you to see an unexpected figure in your HUD settlement at closing. You may see issues with credit or closing costs that are totally new to you. Unfortunately, there is really no excuse to be caught off guard with anything unexpected during this time. Make sure you get a good faith estimate detailing closing costs associated with getting financing on the home. This serves as a rough draft of the contents of the HUD-1 you are bound to get three days before closing. This way, you have ample time to get an idea of the costs involved and you can prepare accordingly. If you are buying, it is crucial that you have ample time to inspect the property to determine any minor and major defects. There could be issues in the property that could serve as deal breakers and affect your willingness to buy. Inspections can reveal termite infestations, structural damage due to carpenter ants, water damage due to recent flooding, cracks in the walls due to unstable foundations, and the like. If the inspection reveals any serious problems, problem areas need to be repaired before escrow can close. If you have limited time to do a walk-through, it is best to submit a purchase offer that contains an inspection contingency clause. This allows the buyer to back out of the offer if the inspection reveals any serious problem with the property, without any penalties. Without this clause you may lose your earnest money if you back out. A thorough examination of the title is the first thing you have to do even before you enter negotiations. This way you catch any clouds on the title which could affect your decision to buy or sell. Work with a title company to do a title search and issue title issuance. The former ensures that no other party has any legal claims to the property involved. This could be a private individual, the state or the IRS. Getting title insurance protects you financially from any future claims against the property. 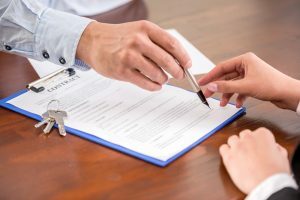 The title company can also determine if there is a lien on the property such as a preexisting mortgage, which needs to be resolved before the transaction can move forward. Avoid making offers on high-risk properties. Properties in high-risk areas, such as those prone to flooding, earthquake, fires, to name a few, may require expensive hazard insurance during escrow. You may even be required to keep paying insurance until the loan is paid. If you are not willing to pay this added cost, make sure the property is not located in a high-risk area by doing a more-extensive walk-through of the neighborhood and asking neighbors, your agent or the city planning department. This presupposes that you have done your homework regarding the figures involved in closing. You can confirm with your lawyer regarding the figures to be sure. Once you know the facts and figures, it is crucial that you have the closing funds ready, which often means getting the bank check ready. A personal check may not be acceptable and you may be required to go the bank to obtain a bank check, delaying the opportunity to close. Experts recommend getting bank checks ready at least a day in advance. It is important to have open communication with all the parties assisting you with the transaction. This includes your lender, your lawyer and your agent. Communicate at least a few days before closing to make sure that all bases are covered. Many closing transactions have been put on hold or cancelled because of one tiny oversight. If the entire team is diligent about making sure that the transaction goes smoothly on the day, you can nip potential problems in the bud. The closing process is the end of the road, but this is also where many issues can arise if you are not prepared. If something does happen that prevents closing on time, your first and best option would be to request the seller to extend the closing date so you can resolve any issues. If you are lucky, the seller may agree to extend the closing date without a penalty. However, it is still prudent to cover all your bases, so you can avoid any issues that affect closing and facilitate a smooth transaction for everyone involved. Get in touch with us at www.lobroscorp.com for more information on how you can close on a property without any glitches, and buy or sell your property for the best value at the shortest time.